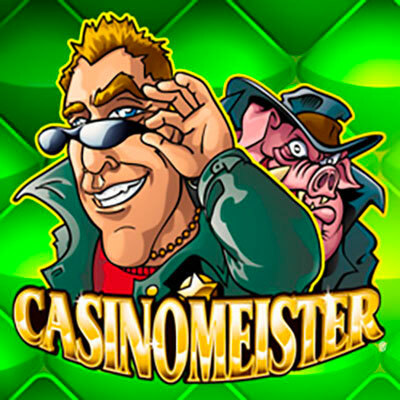 Casino Meister online slots casino game is named after the Casino Meister forum, founded in 1998 to support game players everywhere. The game is a tribute to fair play and it is in this context that you see the No Rogue symbol on the reels. Casino Meister has a 5 reel, 3 row, 20 payline format. There are the usual playing cards at the bottom end of the paytable. Then, moving up through the paytable there is a pint of beer, the no rogue symbol, a casino chip with the casino meister beermat at the top end of the paytable. Click Ito view the paytable and game rules. Select the lines you want and then select your bet. You can play auto by clickingAutoplay, selecting a number of spins on the slider and clicking start. You can stop the autoplay at any time by clicking stop. Triggered by three or more Vortran scatters, you enter the free spins bonus game in which all wins are tripled. There’s no limit on the number of free spins you’ll get. They will continue until you spin the Rogue Bonus symbol. First sight of him, and you have only five free spins remaining. If the Rogue Behind Bars Bonus symbol appears during the final five spins, your access to unlimited free spins starts all over again. You can keep spinning freely unless the Rogue Behind Bars doesn’t appear once you have started your final five free spins. After a win, you can gamble your winnings if you want. Clicking on the hearts and clubs starts the game. You can choose a colour (red or black) or a suit (hearts, clubs, diamonds or spades) to double or quadruple your win respectively if you win the gamble. But if you don’t you’ll lose what you won. NextGen Gaming’s Casino Meister is a tribute game with much to enjoy for the seasoned gamer who has used the Casino Meister forum. It’s a one of a kind game.